When Israeli and Lebanese troops clashed a month ago on the eastern end of their border, near the village of Adaysseh, there were fears the incident would spark another intense and costly frontier war. Soldiers from both sides were killed and, for a while, an escalation right along the border seemed almost inevitable. That the incident was over within hours and a relative calm returned along the rugged and hilly frontier owed as much to the quick response and persuasive powers of United Nations peacekeepers in the region (Unifil), as anything else. The fighting had started over something as apparently innocuous as an Israeli army patrol removing a small tree along the disputed frontier. In the days that followed it brought a quick realisation at Unifil headquarters that proper marking of the Blue Line (the agreed demarcation line between the two enemies, not an official border) was more important than ever. Milos Strugar, Unifil's political director, said that while the August incident had been the most serious clash along the border for more than four years, Israeli and Lebanese governments didn't seem to be showing any signs of hurrying towards a diplomatic breakthrough. Marking out a 120km-frontier (75 miles) might seem a simple enough task. But the wild, rugged topography of this beautiful landscape poses a real challenge to accurately marking out the Blue Line, irrespective of the inevitable objections from one side or the other. 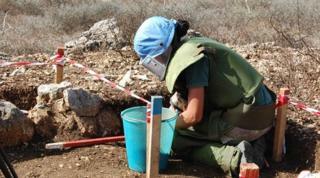 And then there are the minefields: dozens of them littered with thousands of anti-personnel mines all along the frontier and often in the very places where Unifil needs to put its distinctive blue markers - large painted oil barrels perched atop a solid concrete base. In the searing heat of the late summer, I joined a group of Italian peacekeepers right in the middle of a minefield, where an estimated 1,000 anti-personnel mines had been placed some 25 years ago by Israeli troops. As they kitted me out in a full anti-blast suit, Cpt Emmanuelle Amicarella described the slow and painstaking process of clearing a narrow path through the minefield to the point where the marker was to be placed. It only takes a matter of minutes to lay a minefield, but the Italian engineers I was with (as it happens many of them women) worked slowly and carefully, clearing an average of just four square metres a day. It was an exhausting and back-breaking effort. Italian, French and Indonesian soldiers are all part of the massive 13,000-strong Unifil effort to keep peace along the Blue Line. As well as clearing mines, they carry out regular patrols along the disputed border, trying to maintain the relative calm. Their role here was beefed up after the devastating 2006 summer conflict between Israel and Hezbollah, the Iranian-backed Shia militia. That conflict was sparked by a cross-border ambush on an Israeli patrol. By the end of the Summer more than 1,300 people - fighters and civilians - had been killed. One of the biggest concerns now is the alleged re-arming of Hezbollah in southern Lebanon, in contravention of UN Resolution 1701. Israel says that - among other things - Hezbollah is smuggling advanced rockets and weaponry from Syria and its other backers into the region. While Unifil bosses indicate they don't recognise that level of threat and they have no evidence of such large-scale rearming, there is no doubt that Hezbollah has strong support in the villages of southern Lebanon. The militia's flags fly from lamp-posts, and the faces of the many young fighters - who have died in combat with their sworn enemy Israel - adorn the walls of buildings. Hezbollah MP Bilal Farhat remains evasive when I ask him about re-stocking rockets and guns. The group, notably, did not get involved in August's clashes between Israel and the regular Lebanese army. But should a similar incident happen again, Mr Farhat repeats the message of Hezbollah leader Hassan Nasrallah. "Only Hezbollah can defend the country," he says with a broad grin. "The Lebanese army is not strong enough. So, yes, it has been decided by the resistance that we will act (next time)." Threats from Hezbollah and the absence of a peace agreement between Israel and Lebanon all underline the delicate nature of peace on the Blue Line and the need to demarcate the border, once and for all.